Versatile, carbide-tipped three-wing Stackable Slot Cutter Set cuts a wide variety of grooves. Simply adjust the arrangement of the cutters and shims on the 1/2" arbor to create a wide variety of groove sizes for dadoes, tongue and groove joints, rabbets, or biscuit joints. 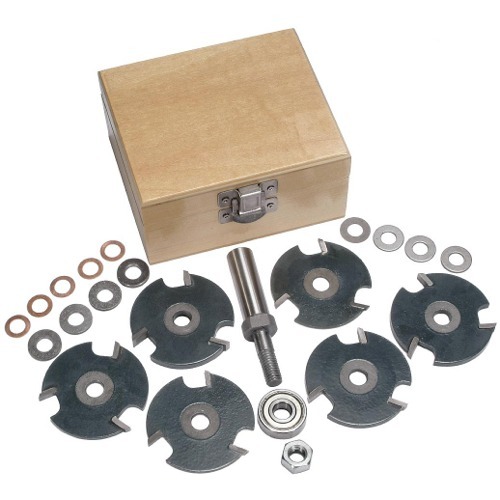 With the included 6 carbide-tipped slot cutters (1/16", 3/32", 1/8", 5/32", 3/16", & 1/4"), shims, and bearing (7/8" OD x 5/16" ID) for 1/2" cut depth, almost any groove from 1/16" to 11/16" can be created. Individual cutters can also create precisely-sized grooves and you can purchase additional bearings to adjust the depth of cut. Storage box included.